I recently finished Linesman by S. K. Dunstall (the nom de plume for a pair of sisters from Australia). It’s a compelling, character-driven science fiction novel, though I’d almost describe the book as more space opera with a touch of the fantastic than as science fiction, though I’m not much for pigeonholing. Rather than centering around hard science, the book presents an entirely novel (no pun intended) method of interacting with space-time…I’ve never seen this approach in another scifi novel. The story focuses on Ean Lambert, one of the titular linesmen who work with the lines that enable space travel. Ean is a kid from the slums who’s managed to become a linesman despite the odd, even if he is still an outsider, given his unique approach to the lines. However, this outsider status causes him to be caught up in a political maelstrom and an unexpected adventure. Although the book focuses on Ean’s tale, his relationship with the lines and a mysterious alien ship, it has a full cast of interesting, well-developed characters. I really enjoyed the female characters, all unique but equally strong. There’s Michelle, who’s either lying about being the daughter of the emperor or – worse – telling the truth. There’s Radko, who has no patience for Ean’s moods. There’s Admiral Katida, who tries her hardest to get Ean into her bed…but does she try hard enough? So many questions…you’ll have to read the book for the answers. Just like I did. This book kept me guessing, pulling me along to the end. 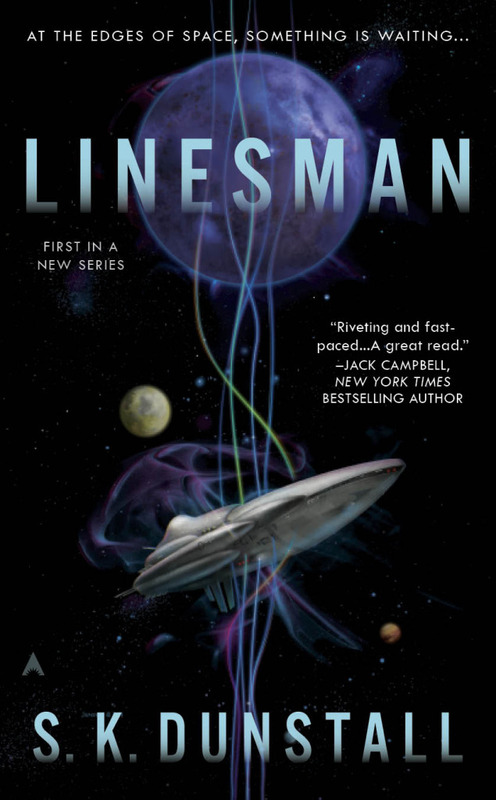 If you’re looking for an enjoyable scifi read, you like character-driven stories, and you don’t require your science to be ‘hard’, I’d recommend Linesman. At the same time as reading this, I was reading the non-fiction We Have No Idea: A Guide to the Unknown Universe — check out my musings on that book.